Droom Grand Sale Auto is Back Again! The rainy season is here! Get your vehicle monsoon ready with droom.in. 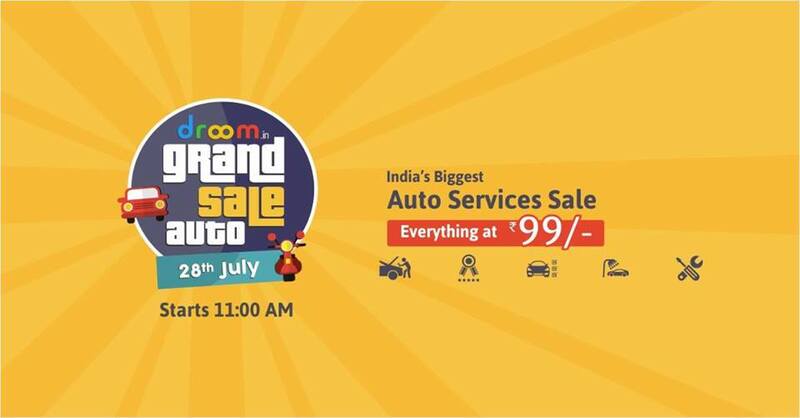 Here’s a chance to save a bundle of money on any automobile service with Droom’s Grand Auto Sale. Whether you need car care & detailing service, warranty, road side assistance, a regular repair, or more, we have you covered. Starting at 11:00 a.m. on 28th July, 2016, India’s Biggest Auto Service Sale is bound to give you huge savings. Yes, you can get every service for ₹99 only! You got that right! For ₹99 you can buy any service for your car or bike. This is a great opportunity to get your vehicle inspected and verified by experts so that you can safely hit the roads. The season offers great driving experience and scenic beauty, but everything can be ruined if your vehicle breaks down in the middle of the trip. Take a service & repairs package to ensure your vehicle’s condition is checked end-to-end and every issue is fixed for good. You can also opt for road side assistance for peace of mind and security as you head out on the roads. Droom offers a wide array of services from verified service provides, so you don’t have to search for every individual service. Droom provides comprehensive services for every vehicle category, accommodating your budget needs. Quick, mark your calendars to shop through the Grand Auto Sale, and remember that the offer is valid for limited time only. Droom’s New TVC Launches Today!